TRAIL DIFFICULTY - The Kearsarge Pass trail is moderate. The Robinson and Golden Trout Lakes trails are infrequently maintained and strenuous. SEASON - Normally, the trails are free of snow from mid-July to mid-October. Summer days may be quite warm but night temperatures often drop to freezing or below even in summer. Afternoon thunderstorms are common. Snowstorms may occur at anytime. The ONION VALLEY TRAILHEAD is 15 miles west of Independence. Turn west on Onion Valley road (Market Street in town) at the traffic light in downtown Independence. The road is usually open from May through November. Begin hiking at the trailhead sign on the north end of the parking lot. Labor up a set of well graded switchbacks through manzanita and pines, reaching the waters of Independence Creek at 1 mile. Continue beside the creek to reach Little Pothole Lake ½ mile later. Another set of switchbacks lead to Gilbert Lake at 2.2 miles. Keep with the main trail to reach Flower Lake a short distance later. The trail then ascends up steep, rocky switchbacks gaining sight of aptly named Heart Lake at 3.5 miles. More switchbacks lead to Big Pothole Lake at 4.2 miles, and your first look at the pass ahead, at 4.8 miles. The view from the pass is spectacular, looking down upon Bullfrog, and Kearsarge Lakes. University Peak is to your left and Mt. Gould to your right. Continue on over the pass for good camping and fishing at Charlotte Lake, just over 3 miles further in Sequoia / Kings National Park. Raingear, good boots, and warm clothes are essential. Sunglasses, sunscreen (factor 10 or more), a hat and insect repellent are advisable. An ice axe may be needed in early season. The trails seldom approach water So it's a good idea to carry some along. Giardia is a serious problem. Boil or filter all drinking water. The Kearsarge Pass trail and many parts of Kings Canyon National Park are as popular with bears as they are with people. Carry at least 50 feet of rope to securely hang your food using the COUNTER BALANCE method. Food storage facilities have been installed in some backcountry locations where storage in trees may be ineffective. Check at the Ranger Station before starting your trip for current information on bear activity. Forest Service: John Muir Wilderness & Sequoia/Kings Canyon Parks topo map set (15 min. scale); available from the Ranger Station. CAMPGROUNDS are available on a first-come/first-served basis, some can be reserved online in our campgrounds section such as . ONION VALLEY: which has 29 unit family spaces. Piped water, flush toilets. Many walk-in sites. Fee. Usually open late May - late Sept.
LOWER AND UPPER GRAYS MEADOW:can be reserved online. 6 miles west of Independence on Onion Valley Road. 52 unit family campground. Piped water, flush toilets. Fee. Open March - October. WILDERNESS INFORMATION STATION: Open July 1 - Labor Day. NO TELEPHONE. Parking space is limited. Overflow parking is permitted on the south shoulder of Onion Valley Road east of the parking circle. A wilderness permit is required for all overnight hikes. Campfires are not permitted east of the Sierra crest, or above the 10,000 foot level in adjacent Kings Canyon National Park; portable gas stoves are recommended. Wood fires in heavily used areas result in physical damage to the wilderness and impair the natural beauty of the landscape. Where terrain permits, camp at least 100 feet from lakes and streams. Camping closer than 25 feet to water is strictly prohibited. Protect water quality, wash dishes and yourself at least 100 feet from lakes and streams. Even biodegradable soaps add pollutants. Toilets should be at least 100 feet from camps and water. Trail switchbacks are expensive to construct and maintain. Shortcutting them hastens destructive erosion and is illegal. Yield the right-of-way to pack and saddle stock on the trails. One night stay limit at each of the camp areas around: Rae Lakes, Sixty Lakes, Charlotte Lake, Dragon Lake, Dollar Lake, Kearsarge Lakes, and that portion of the John Muir Trail from Woods Creek to Glen Pass. Bullfrog Lake is closed to all camping and grazing. A California State Fishing License is required for fishing. 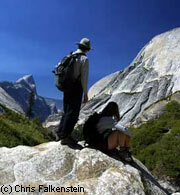 State fishing regulations apply in the John Muir Wilderness and Sequoia/ Kings Canyon National Park backcountry. Discharging of firearms in the John Muir Wilderness is not permitted except for taking of wildlife as allowed by State law. Hunting is prohibited in the National Parks. Pets and firearms are NOT allowed in the National Parks.